The skies are turning cloudy, and so is my neutral of choice. My gorgeous sister recently acquired this gray double-breasted leather jacket. Both biker chick tough and luxuriously chic, it's definitely a piece I'll covet all season long. Add interest to a monochromatic look by playing with texture. This look features a sweater tank worn over a billowy cotton dress paired with suede ankle boots. It was unseasonably warm today, but for cooler temps I would add a jacket and tights. 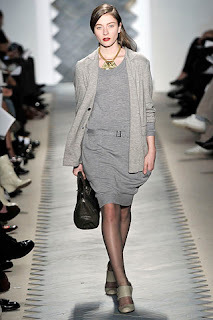 On the Runway: 3.1 Phillip Lim Fall 2008 RTW. Image source: Style.com.